Every year in Northern Ireland about 500 people die from bowel cancer - the second biggest killer after lung cancer but curable if treated early enough. 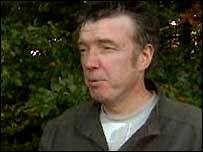 One of the survivors is former Undertones bass guitarist Mickey Bradley who has gone public about his bowel cancer to encourage other sufferers to seek help. Teenage Kicks by the Undertones was an anthem for a generation and those days of pop success were heady days for the five boys from Derry. But in the last year Mickey Bradley, now a producer for BBC Radio Foyle, got terrible news - he had been diagnosed with bowel cancer. "There's no point in feeling sorry for yourself - I was very lucky that I didn't get depressed I suppose, but this is what you've got, just get through it," said the now recovered and back at work Mickey. With three children under 11 it was a difficult time for the Bradley family, with Mickey's wife Elaine saying she still felt very emotional about it. "Personally I was devastated," she said. "It just wasn't what I expected for my husband and I'm still very emotional about it, but Michael is a very practical person so I would take my lead from him. "Because he was very calm he knew that there was family to deal with. "We didn't tell the children for the first month and you found that you were whispering around the house - you know everybody was talking in the corners. "Once we told them what was happening it was such a relief." The six months of chemotherapy after the tumour was removed were the lowest point for Mickey Bradley, but he said that he was always glad it had been him rather than Elaine or one of the children who became ill. He said that those who fear they may have cancer should not delay going to their doctor. "If anyone ever has the symptoms, or has any worries, there's no point putting it like the bill behind the mantelpiece," he said. "Deal with it now - you have to go and just say to your doctor and I'm so glad I did that. "If I had held onto it and worried too much possibly the outcome would have been a lot different." 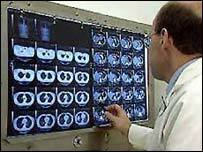 A leading cancer charity has called for Northern Ireland to get its own bowel cancer screening programme. Northern Ireland has the second highest rate of death from bowel cancer in the UK and the highest incidence rate among men in Europe. Action Cancer highlighted the issue as a campaign to raise awareness of the illness got under way last week. Survival rates from bowel cancer increase the earlier it is diagnosed in sufferers. Poor diets, obesity and smoking are blamed for the high death rate from bowel cancer in Northern Ireland.